Our trip today was planned around flight schedules, and thus began with some intrepid enthusiasts collecting me from Bratislava Airport in Slovakia, conveniently located less than an hour away from the Austrian capital of Vienna. These enthusiasts had themselves driven to meet me from Budapest in Hungary. As crazy as the above sounds, it all made perfect sense at the time. Foreign-registered cars require a special toll sticker to drive on Austrian motorways, and we found this out the hard way ten minutes into our journey when the local police stopped us and issued us with an on-the-spot €120 fine. It is an established fact that ignorance of the law is not a defence, but it might have been nice if the authorities had taken account of the fact that three English speakers in a Hungarian-registered rental car might not have been aware of this regulation, especially given that there was no warning of it on road signs at the border crossing. 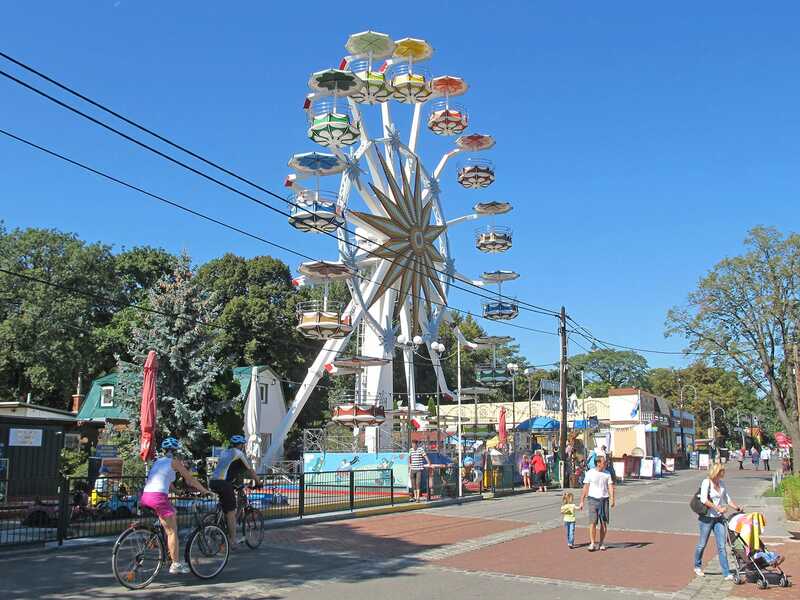 Böhmischer Prater was set up during the 1980s by a small group of showmen led by the Reinhardt Family. The name clearly trades off the more famous Wiener Prater, but the target market is completely different; unlike its larger cousin, the "Bohemian Prater" is geared primarily at families with young children. The biggest attraction by far is a twenty metre high Riesenrad prototype from Soriani & Moser, interesting for being the first Ferris Wheel to be supported by a single pole rather than a more traditional triangular base. There is also a small coaster; Shark Trip (#1806) is a peppy little family ride equipped with an enthusiastic water spray in the middle of the course. Our second stop of the day was at a particularly nice family park with two roller coasters found on the outskirts of the Austrian city of Eisenstadt. The first of these was Pendelbahn Flic Flac (#1807), an up-charge Heege Butterfly originally constructed in 1996. While officially priced at €1, the vending machine that sold the required token would only accept banknotes, meaning that the effective charge was €5, easily the most I've ever paid for such a pathetic credit. We'd probably have skipped over the park entirely were it not for the presence of a much more significant coaster. Götterblitz (#1808) was built by Mack four years ago using the same track and trains as the highly regarded Pegasus at Europa Park, and as expected it proved to be an excellent ride. This park was known as Vidámpark at the time of this visit. Vidámpark is a park in very obvious decline. The slide began a few years ago when park management decided to switch to a pay-one-price model instead of selling individual ride tickets. 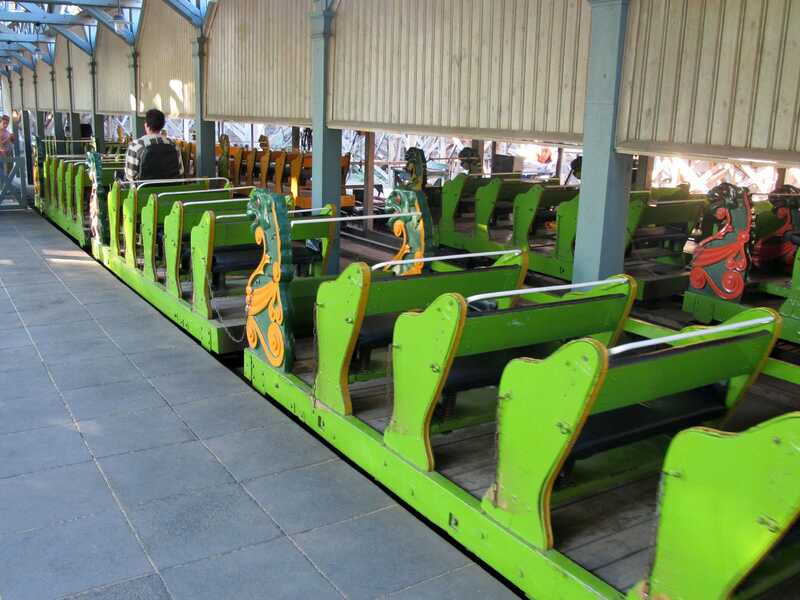 The impact to attendance resulted in a significant drop in income, and that put the park into a downward spiral from which it seems unlikely to recover. Today it felt like we were visiting an oversized carnival rather than a landscaped city park, and the condition of certain areas was more reminiscent of the third world than of a major European city. Spinning Coaster (#1809) was added to the park three years ago to replace the Schwarzkopf Looping Star. While a decent enough ride, it could not be described as an upgrade; its only real selling point was the lack of the ridiculous triple restraint system found on the copies built by Golden Horse. We only rode once, preferring to spend most of our time on the classic Hullámvasút. This ride was at least running as we'd remembered it, though it was worth noting that only two of its six trains were in use despite a lengthy queue – a sad reflection on the fact that the pay-one-price model offers no incentive for efficient operations.